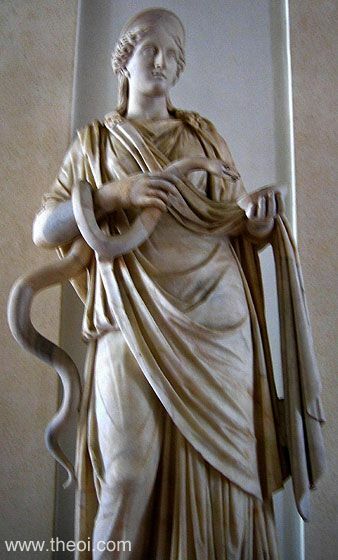 HYGEIA was the goddess of good health. She was worshipped as an associate deity of her father, the medicine-god Asklepios. 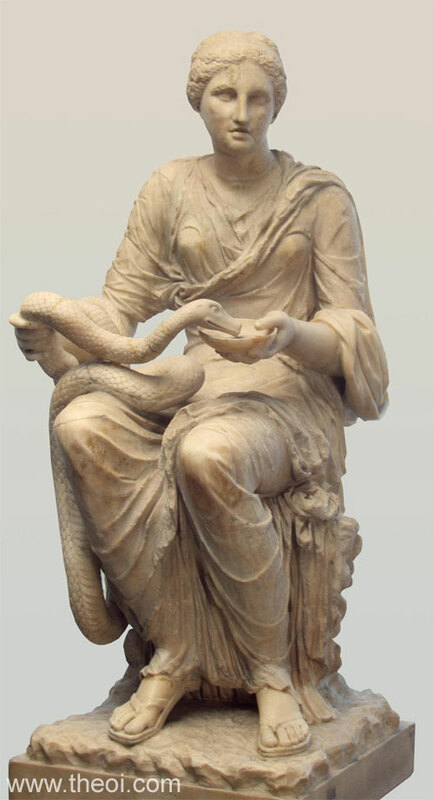 In sculpture Hygeia was depicted as a woman either holding a serpent or feeding a serpent from a bowl. "[On the Akropolis, Athens] are figures of gods; of Hygeia (Health), whom legend calls daughter of Asklepios, and of Athena, also surnamed Hygeia." "[The temple of Amphiaraus in Oropos, Attika] The altar shows parts . . . The fourth portion of the altar is to Aphrodite and Panakeia (All-Curing), and further to Iaso (Healer), Hygeia (Health) and Athena Paionia (Healer)." "When you have ascended the citadel [at Megara] . . . you see . . . The image of Asklepios and also that of Hygeia were made by Bryaxis." "By this gymnasium [in Korinthos] are temples of Zeus and Asklepios. The images of Asklepios and Hygeia are of white marble." "[In the santuary of Asklepios at Titane, Sikyonia :] Of the image [of Alexanor, granson of Akslepios] can be seen only the face, hands, and feet, for it has about it a tunic of white wool and a cloak. There is a similar image of Hygeia (Health); this, too, one cannot see easily because it is so surrounded with the locks of women, who cut them off and offer them to the goddess, and with strips of Babylonian raiment. With whichever of these a votary here is willing to propitiate heaven, the same instructions have been given to him, to worship this image which they are pleased to call Hygeia." "The most famous sanctuary of Asklepios at Argos contains at the present day a white-marble image of the god seated, and by his side stands Hygeia." "[In the sanctuary of Asklepios at Epidauros, Argolis there is] a temple to Hygeia, Asklepios, and Apollon, the last two surnamed Aigyptios (Egyptian)." "[Depicted on table made by Kolotes at Olympia, Elis :] On one side are Asklepios and Hygeia (Health), one of his daughters." "Along the left side of the great temple [at Olympia, Elis] Mikythos dedicated other offerings: [statues of] . . . deities, Asklepios and Hygeia." "[There is at Aigion, Akhaia] precinct of Asklepios, with images of him and Hygeia." "[At Megalopolis, Arkadia] is an enclosure sacred to the Great Goddesses (Megalai Theai) . . . Carved in relief before the entrance are, on one side Artemis, on the other Asklepios and Hygiea." "[At Megalopolis, Arkadia] there is a sanctuary of Asklepios, with images of the god and of Hygeia." "Here [Gortys, Arkadia] is a temple of Asklepios, made of Pentelic marble, with the god, as a beardless youth, and an image of Hygeia. Skopas was the artist." "On one side of the image of Athene [at Tegea, Arkadia] stands Asklepios, on the other Hygeia, works of Skopas of Paros in Petelic marble." "[At Thespia, Boiotia there is an] image of Tykhe, and in another place that of Hygeia."